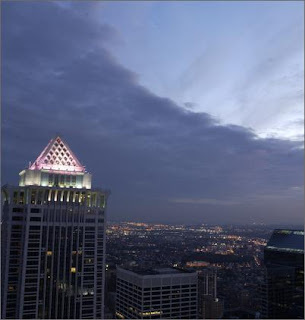 View from windows - overlooking the Philadelphia Sky Line. The Knot hosted a vendor appreciation party for local wedding professionals this week. It was held at the amazing Top of the Tower and the theme was cuban. We were welcomed with orange mojitos. They had the two rooms set up very differently. One with stationed food, a band and brown colors. The other had the bar, a DJ, small tables and lots of orange and tangerine linens and uplighting. The chef went all out with lamp chops in a chipotle chocolate sauce and lobster chiveche. Kudos for a very enjoyable evening. check out Top of the Tower for wedding info. They can do ceremony and reception and really customize your menus.